Housed in a handsome, classically inspired mahogany case, this fine musical instrument from rural New England shows Yankee craftsmanship and ingenuity at its very best. 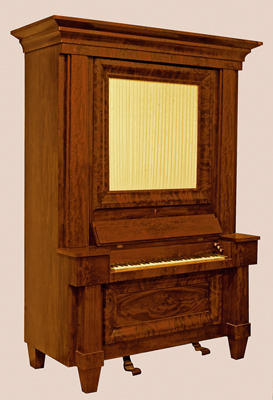 Skillfully restored some years ago by Jeremy Adams of Danvers, Massachusetts, the instrument is once again playable, following the reinstallation and tuning of its 191 pipes. Little is known about David Dutton, a native of New Hampshire, who lived from 1792 to 1882. According to Barbara Owen, writing in her standard work, The Organ in New England (Raleigh, N.C.: The Sunbury Press, 1979), Dutton was one of a group of eight chamber-organ builders working in Mont Vernon in the 1830s and '40s whose activities were "partly or wholly avocational in nature." Dutton, in fact, is today perhaps best known as a clockmaker, but in the 1850 census records he was listed as an organ builder. 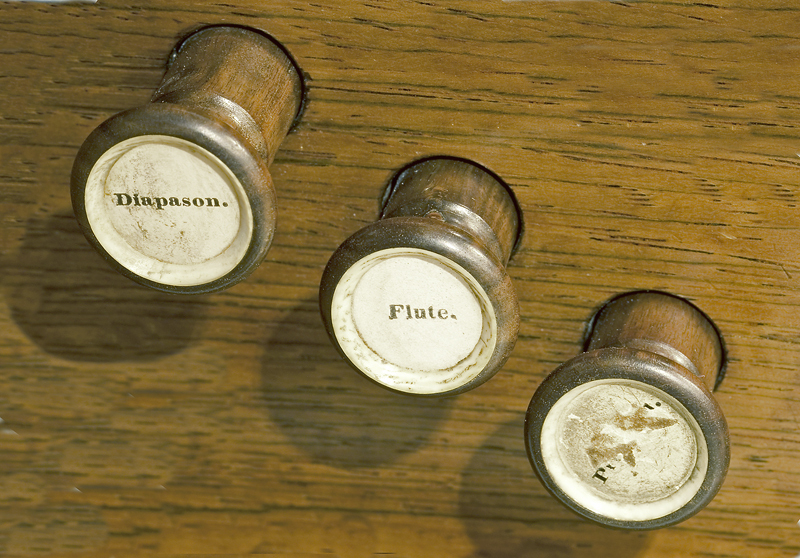 The NMM's instrument, however, is thought to be Dutton's only organ still in existence. NMM 10778. Chamber organ by David Dutton, Mont Vernon, New Hampshire, about 1850. Compass: GG (dummy GG# key) to a3 (5+ octaves). 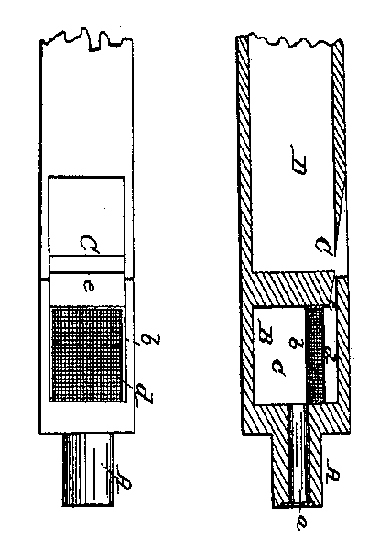 Two pedals: swell (left) and bellows (right). Gift of W. Thomas Edwards in memory of Stephen E. Long, Seattle Washington, 2004. Whatever his professional status may have been, Dutton was a consummate craftsman. Something of the clockmaker who made all his gears of wood is to be seen in the NMM's organ, with its pipework all of wood (right) and the neatly made backfalls (wood levers) fanning out behind the keys (below). 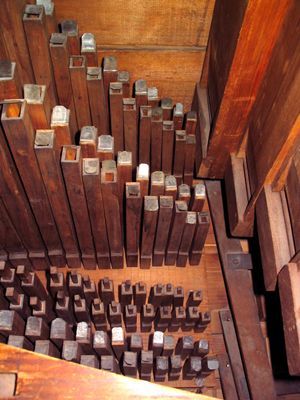 There were two main schools of early American organ building. 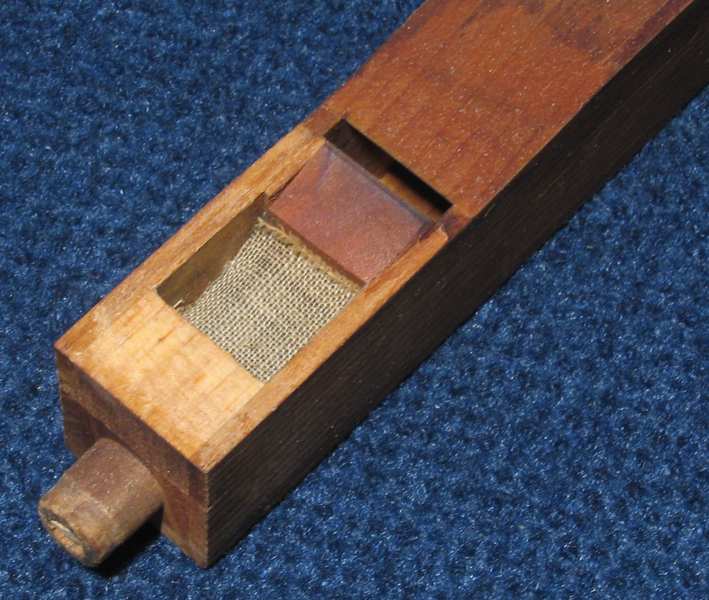 In Pennsylvania, German immigrants and their descendents made instruments in a style derived from that of central Germany. 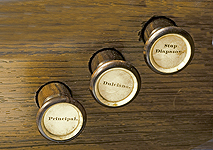 The NMM's organ by Christian Dieffenbach, Berks County, Pennsylvania, 1808 (NMM 4905), also on exhibit in the Abell Gallery, is an important example of that type. 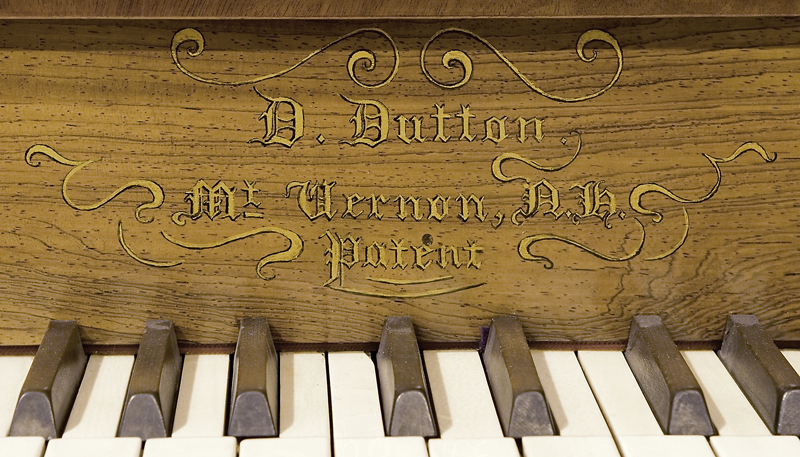 On the other hand, Dutton, although the particular source of his knowledge of organ building is unknown, worked firmly within the English-derived tradition practiced in New England and New York. A typical English feature in the NMM's Dutton organ is the compass, which begins on low G, not on C. Also reminiscent of late-18th- and early-19th-century English chamber organs is the disposition, with its few gently voiced ranks and—hidden behind the decoratively folded cloth front—the provision of swell louvers to control the volume. 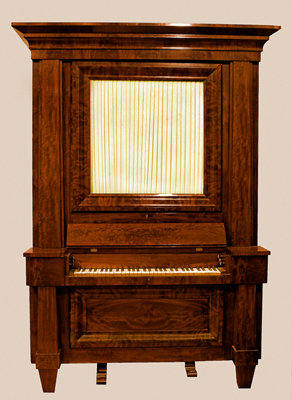 While the Pennsylvania-German builders tuned their organs in equal temperament, English builders and their American followers used varieties of the ancient meantone temperament until the middle of the 19th century. 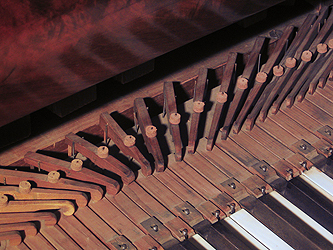 The present "meantone" tuning of the Dutton organ, in which the major thirds of the most commonly played keys are pure, follows the maker's apparent intention. As a result, pieces written with more than two or three sharps or flats in the key signature can not be played. 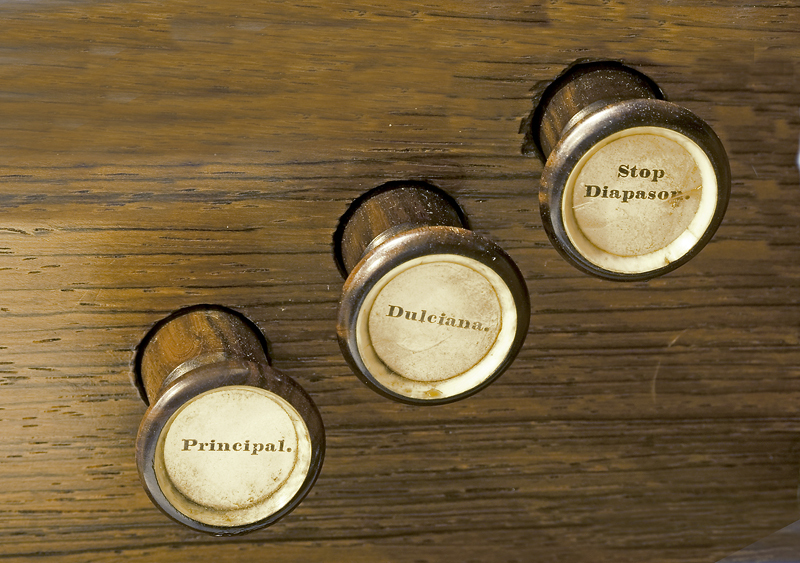 Dutton added an interesting innovation, to which the word Patent on the nameboard refers. 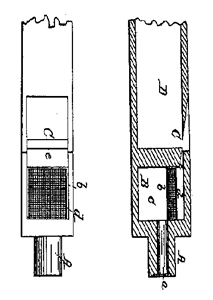 This is U.S. Patent 5,520, issued to David Boardman of Mont Vernon, N.H., on April 18, 1848, which provides a terminus a quo for the date of the organ. 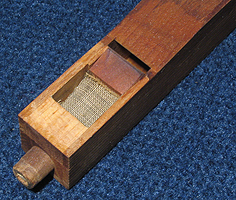 By removing the wooden cap at the lower front of a typical pipe, one can see Boardman's invention, "placing a partition of coarse cotton cloth" in the path of the wind within each pipe's foot. "By means of the partition of cloth the air is divided into a great number of small streams before it rushes out of the eduction passage . . . By such division," Boardman claimed, "or by some other cause not known the tone of the pipe is very highly improved." Otherwise, Dutton's pipes are mostly traditional in construction and very conservative in their voicing on low wind pressure, with no nicking of the windway. The pitch (a1 is ca. 452 hz) is about a quarter tone above modern pitch. Lit. : John Koster, "A Chamber Organ from the Granite State Goes on Exhibit in the Abell Gallery," National Music Museum Newsletter, Vol. 33, No. 2 (May 2006), pp. 4-5. 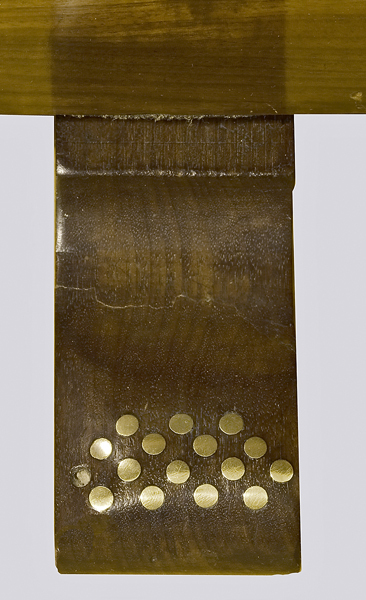 John Koster, "Historical Organs in the Museum Context," The Tracker, Vol. 50, Nos. 3 & 4 (Summer/Fall 2006), pp. 31 and 35.